Whenever decentered models of thought challenge human consciousness, an external structure affects reasoning, expanding—amongst other concepts—the perception of growth, origin, process, and transformation. When this happens, thought (or reason) detaches from its linear method and encounters a labyrinth spliced with an untouched, unexplored understanding of time. What is a labyrinth if not a process of bifurcation, a failed human ode to time and simultaneity? 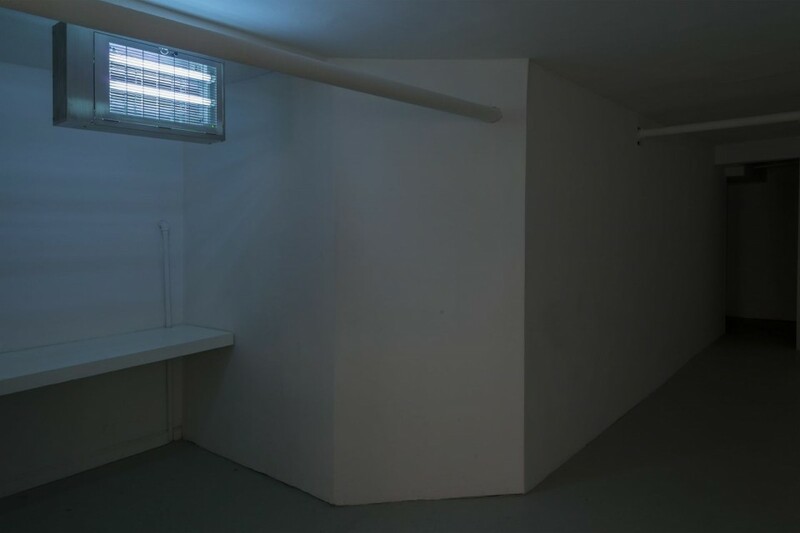 This year’s six-month seasonal program at The Artist’s Institute—Hunter College’s project space, located on a small basement on Eldridge Street in the Lower East Side—was a delicate investigation into the overlapping perceptions of life as process and material. The empirical and the ontological were weaved together to reevaluate human’s relationship to nature’s own thinking structure. French artist Pierre Huyghe—along with the Institute’s director and curator Jenny Jaskey—selected upwards of 18 artists, philosophers, and scientists to join them during the course of the program, including Fernando Ortega, Pierre Joseph, Camille Henrot, Ryan Gander, Sean Raspet, Etienne Chambaud, Ian Cheng, Melissa Dubin, David Horvitz, Tristan Garcia and Dr. Ali Brivanlou. Talks by philosophers and scientists, interactive videos, and artworks intertwined with biological experiments made this program a stimulating platform, utilizing the gallery space as a laboratory for questioning in which time and chance were the primary mediums. The works on view during the course of the program revealed a sense of analysis towards established ideas about existence and origin, provoking the viewer, asking them to reevaluate such basic questions. Each work in the space aimed at the same sensibility of cunningness: An invisibility of intention full of purpose. Huyghe scraped the white paint from the sidewalls, exposing remnants of what was shown in the earlier weeks of the program. In an attempt at reverting time, he brought the anthropological recent past into the present. The room was almost empty; there was no obvious evidence of art-objects. However, the viewer remained perplexed; there was no doubt something was there, loaded with content and meaning. What was omitted was charged with power, floating in the air. How is material—the palpable—different from the intangibility of the mind? What does being present in time really mean? A sense of curiosity filled the gallery, as meaning dilutes through negative space. A noise resembling the sound of an electroshock was randomly heard. It was not a faulty wire, but rather Fernando Ortega’s fly electrocutor device, Untitled (2003), where a fly died by electrocution initially attracted by light. The room reminded us, through fleeting darkness, the importance of flies in hierarchical living structures. The few objects displayed in the room were part of the gallery’s own life and routine. For instance, beside the window a small pot held a plant, an electronic device attached to its leaves. 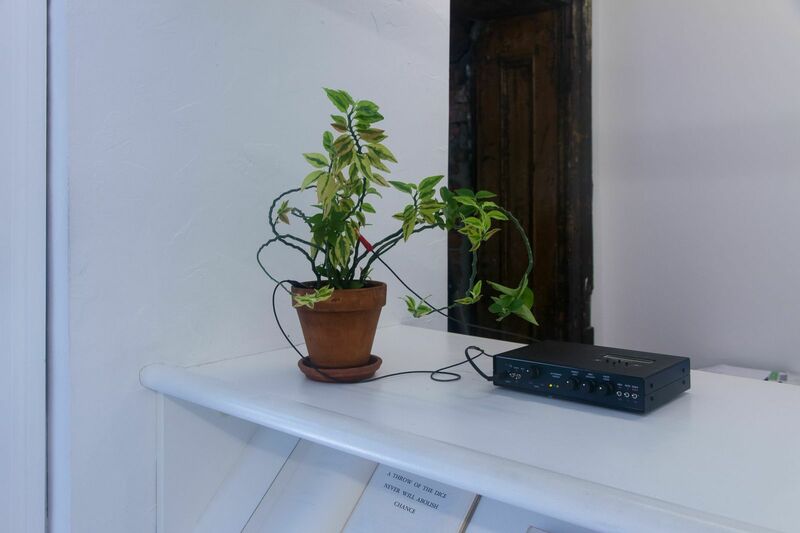 Martin Roth’s Untitled (Plant) (2014) used a Damanhur device for viewers—or listeners—to consider a plant’s perception to the external world. If listened to closely, tonal music emerged from the plant’s electromagnetic waves, transformed into sounds by the device. It is said that each plant emitted a different sound due to individual vibrations. We are reminded then, that an autonomous subjectivity also resides in nature, detached from human thinking. On the back wall was Ian Cheng’s interpretation about the history of consciousness. More & Less Than Human (2013), a chart on paper and tape, suggested three evolving models of being. 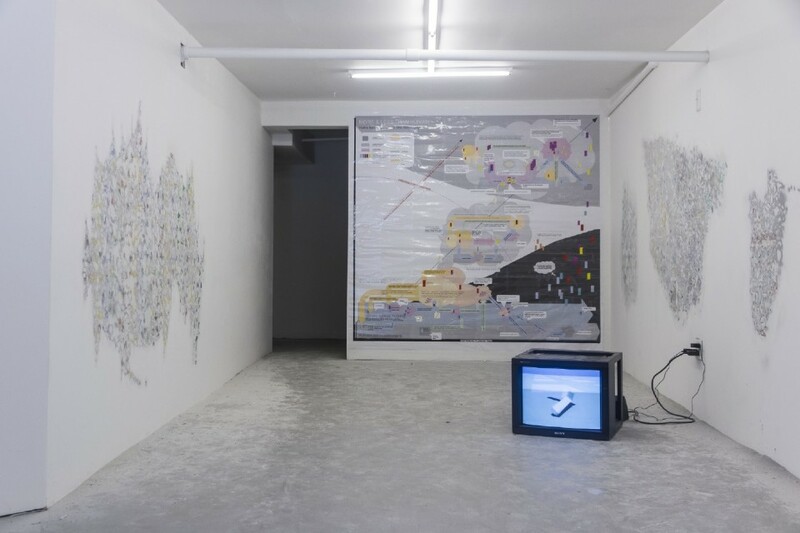 The viewer’s eyes followed non-linear connections in the diagram, reinterpreting a cyclical sense of order in the history of thought. The three levels suggested that there was indeed an evolutionary development in consciousness. Initially, this process was produced by non-human living beings, establishing their own communication and behavioral laws, generating language. Later, codes and concepts were attributed to these structures, and human beings developed through sociality—a new reality unleashed by the power of language. This created a complex image of time and perception, which is still being interrogated. Finally, Ian Cheng’s third level of consciousness denotes our contemporary stance on the mind’s collective reality, proposing that there is a sense of impermanence, and a never-ending, never-arriving quality in which creation and destruction are incessantly at play. Ultimately, it suggests that we are never fully human, and will never be fully present. The Artist’s Institute also made available four pamphlets, which acts as a binder. Each pamphlet was published separately throughout the duration of the season, featuring Huyghe’s selections of texts by authors that have explored similar questions regarding perception, time and life-structures. His careful craft to philosophical rhetoric is revealed through the selection of texts. These subtle juxtapositions are a reminder between the resilient shift in materiality and consciousness. Huyghe’s project reminds us about the kaleidoscopic perception of life, and our human capacity for transfiguration.